The purpose of this research was to determine the §effects of a group fitness exercise class on fitness §and pscyhosocial parameters and menopausal symptoms, §in females aged 42-58 years. Twelve women aged 52.3 §(SD=4.6) years participated in the study. Subjects §self-selected onto a sedentary, low active control §group (n = 5) and a group fitness experimental group §(n = 7). The experimental condition participated in §an 8 week moderate intensity group fitness §intervention incorporating cardiorespiratory §endurance, muscular strength and endurance, balance §and flexibility exercises. There was a significant §difference between groups in percentage change §scores on body fat percentage. 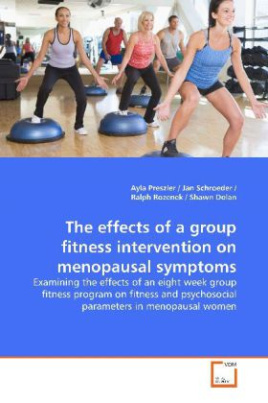 Women in the group §fitness condition experienced a decrease in body fat §percentage over the course of the study. No other §hypothesized significant results were found.